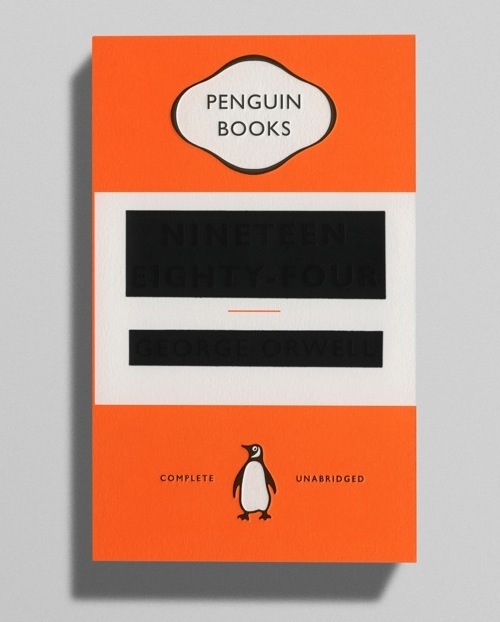 That’s the terrific cover of a new edition of George Orwell’s 1984. It’s part of a series of new Orwell cover designs by David Pearson. This entry was posted in Uncategorized on January 11, 2013 by Nick. I like the look of it, but I can’t read the title. I get the rhetorical point, I think—the title has gone down the memory hole—but if you can’t tell the name of the book isn’t that a problem? Tom, click on the cover designs link. You can see the title and author through the blackout (maybe Nick will include that shot as well), but only just. As the designer says, it was a risk, but in this case a pretty brilliant one, I think. Yeah, I can see Orewell’s name–just barely, as you say–and I’ll assume the title is readable if you’ve got the book iteself right there. Interesting.